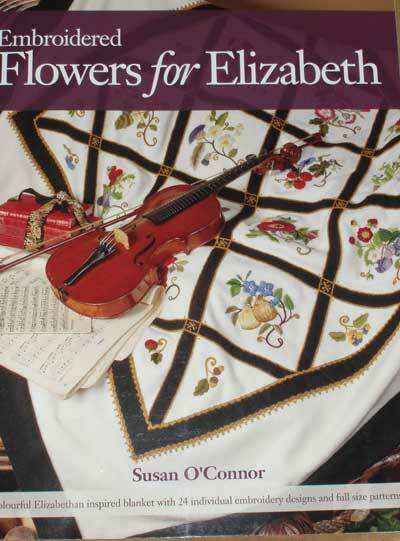 Here’s the second give-away for Embroidered Flowers for Elizabeth, that gorgeous book by Susan O’Connor. Please (please) read the give-away rules carefully to make sure that you are entered into the drawing! This give-away includes one copy of Embroidered Flowers for Elizabeth, courtesy of Country Bumpkin. The give-away is for anyone, world-wide. If you do not live in the US or Canada, I will send the book via the least expensive air mail option. 1. Your comment must be left on this article, on the website. Please do not respond via e-mail or leave comments on other articles. If you do not know how to leave a comment, you can visit this Blogger Help Page that shows you how to leave one. If you are reading this in your e-mail inbox, via the daily newsletter, simply click on the title of the article (in purple), which will bring you directly to this post on the website where you can leave your comment. 2. Please make sure that you sign your comment so that I have a name. You may post the comment anonymously, but inside the comment, please leave a name! If you were to stitch up some of the projects in this book (you can see some of them on my review of Embroidered Flowers for Elizabeth), what type of thread would you use? Would you stitch them as originally described, with Paternayan crewel wool, or would you be more likely to use the thread conversion chart provided in the book and convert the colors to Soie d’Alger or DMC? and Why? 4. Leave your comments by Thursday, March 11, 5:00 am CST (I’m in the Midwest USA), and I’ll announce the winner that morning. The winner will need to contact me via e-mail once announced. March 2, 2010 Embroidery Flowers for Elizabeth Winner Announced! November 26, 2018 Stitcher’s Christmas, 2018: Passion for Needlework x 5! If I were to stitch projects from the book, I would probably start out doing some samples or trial runs using various threads I have on hand just to see how they look. When (if!) I began on the actual blanket, I would most likely use the recommended Paternayan crewel wool. Hi Mary, Thanks for the lovely giveaway. If I were to stitch the little projects in this book I would be forced to opt for either silk or for the DMC threads. The projects look lovely in Paternayan wool but crewel wool is not available in India nor is the Soie d'Alger silk yarn. We do get silk threads and also DMC threads. So those would be my choices and they are available in a variety of colours which will help achieve the shaded effect. I would do them in wool because my first great love in needle work was crewel embroidery! If I can find Appleton, that is my thread of choice. If I one the book and was making one of the projects I would probably stitch with DMC threads. These threads are more readily available to me in a local needlework store….but if they had something else that I could use…I would certainly try them. Thank you for offering these gifts to us. Gosh I'm the first!! Please could I be entered into this competition as I would so adore to own this book. I would use the conversion chart for DMC as I mainly use that or Anchor threads. I have a wonderful supply, some inherited from my Grandmother and my darling Mother has also given me her supply as, aged 90, she no longer sews. I have not only my Grandmother's silks but her whole sewing box which also had the felt needle case I made her when I was about seven! I think I would like the embroidery with wool crewel because I like the rendering and the warmth of the line … but why not also try silk Algiers, because in fact I have never yet had the opportunity to try to embroider with silk …. once again -a chance to win this fabulous book!Lady Luck please help me win this book. Since i have always worked with Anchor skeins may be will work with the same'my favourit'skeins. How wonderful to have a second chance at winning this beautiful book. Good question – I have only really stitched with DMC threads and that is my comfort zone. However, I would love to work with silk and wool someday. My guess is that I would do a trial run with DMC and then graduate to the wool and perhaps silk. I would love to use silk, but need to wait until the roughness of my winter dry hands disappears. As an alternative, DMC would be my thread of choice. Now that I am retired I have more time to experiment with different techniques. I would enjoy having this book to add to my library. I would embroider the motifs using Uineyard Silk (wiltex, Inc.). The colors are lush and delicious. I would use silk because I have been dying to find just such an occasion to do so. The book is a fabulous find and it would be a great help in all embroidery works. I did some embroidery when i was young with my grandmother, and am now just getting back into it. I would try and find the wool, but as i live in a small town in the middle of no where… lol… i might end up with DMC. I like to try things they way they are intended if i can. Thank you for offering another copy of this beautiful book. I would use the conversion chart for DMC thread because that's what I have. I haven't worked with crewel wool and would rather not start another stash. I love to use flower patterns for crazy quilting and the ones you showed in your review are especially beautiful. I might use Anchor rayon threads as well. I like the shine of rayon. I would like to enter the drawing. The embroidery shown in this book is wonderful and would be a great challenge. A month ago I would have answered this question: To do these designs I would use the conversion chart. BUT, I have since been reading your newsletter, wait for it daily and have my coffee with you, and have found the assembly of the piece very interesting. A lesson and a great time to think about how the pattern will develop before picking up the needle and stitching. I am intrigued by all the threads you have and are able to just go to your supplies, try this, try that and change things. So, yes, I would get the threads prescribed by the author, enjoy the collecting of it, learn, and then perhaps try to substitute new and different medias as I grew more secure with my skills. I live in Chicago and I travel to Wisconsin at least 1 week a month and have noticed a lot of new shops that have yarns/threads, even have seen some new spinners out there. The collecting, even ripping the studio apart for blackwork, has its' surprises, you never know what else you will find. I will do all three I think – use the wool, the conversion and try to develop my own supplies. Thank you for the opportunity to grow with my needlework instead of staying static and just plodding on. I am enjoying myself far more since learning more. Thank you! My knitting season is coming to an end for the warmer weather so I would spend my lazy summer days stitching away at those gorgeous florals. I think any thread would be lovely (these are so beautiful), but I would do them in silk. I plan to make holiday ornaments and I like silk for those. Thank you for a second chance!! I have a stash of Appleton Wool just waiting for such a project. Your web-site has inspired me to "push the envelope". Ccan't wait to get started. Oh I would love to own this beautiful book! Should I win, I most likely would use DMC, as I have it in my stash, and because I'm several hours away from the nearest yarn shop. Thank you. I'd love to stitch some of the smaller motifs in silk, just because I love the feel of stitching with it. Thanks so much for your generous giveaways. Dear Mary, Two reasons: 1- The only time I prefer wool , is when I do tapestries.For embroidery I prefer DMC stranded cotton and when available, stranded silk. 2-The wool for crewel work is hard to come by and if you do get it, very expensive so economics also play a roll. Because I am a pensioner, I made provisions to build up a nice assortment of threads in the past. But as with all things prices went up and I only buy stuff when really needed. HI — I would love to try some of these gorgeous designs in the wool in which they were intended o be stitched. I have previously tried crewel stitches in cotton floss, but they certainly look better when the loft of the wool fibers is added to the overall effect. I would experiment a little with DMC and the silk together on a small design but my main choice would be the wool and silk together, both in same needle (only a little silk to wool) and separately in the one design. I haven't tried it but the thought has always appealed to me. I would have to give careful thought to placement of each so its not higgley piggley but a balanced, pleasing combination that also compliments the design. I think I would say that is my reason. To extend myself to make this experiment work in my own way. If I would stitch something from the book I would use crewelwool from Renaissance Dyeing in the Elizabethan ranges, because I love this wool and the colours would be as near to the original colours from the past then possible. I am a beginner so first would be wool, but silk is also an option when I am a bit more advanced. For the blanket I think I would use wool–just seems in keeping with the project. If I were to do individual plates, I think silk would be beautiful, maybe with a little goldwork thrown in, for a pillow cover or framed piece. Your current goldwork project is going to be lovely! Thanks for another chance to win this book. The thread of choice would be difficult for me since I love wool and silk, both are available to me. I think it would be fun to work with the silk, the luster is very enticing and would lend to more realism. I can see my 89 year-old mother sorting the colors for me while I worked on the project. It would be an excellent pastime for the two of us. If I were to stitch up some of the projects in this book and I was in the United States, I would use the threads indicated so I would feel that I wasn't missing something. If I was in Costa Rica I would use the conversion chart and use DMC because anything else is very hard to find if at all. I'm sure I would use the conversion chart for some silk threads that I have been saving for a special project. The colors are so vibrant and stitching with them is such a delight. Love your projects and am so impressed at how quickly you work them up. Well, I'm obsessed with wool, but I've never stitched with it, so I will probably use DMC (which is easier to find) at least at first, then maybe later venture into the world of wool stitching. I would love to win a copy of this book. I wouldn't be stitching the whole blanket (even though I think it would be wonderful!) so I think I would use DMC and wools in different projects. Right now I don't know how far I might have to travel to get the wool, or I would say I would definitely do that. Thanks again for another chance to get this beautiful book. I would probably use DMC threads to do one of the blocks because that is the thread I'm most comfortable using. I think I would have to do some trials. I'd love to try the wool, but I've never worked with it and I'd have to order it, so it would be much more expensive. OTOH if I was doing the whole blanket–which I would love–I think it would be best, and worth it. Maybe I'd do one motif first with DMC as practice and hang it on the wall or something. I would use DMC, as that is what I have the most of in my stash. I wouldn't necessarily use the color conversion chart; I might just choose my own colors! I would probably not use any of the the recommended threads! I would love to see some of these stitched up in Chinese (flat) silk, or maybe even rayon. I also have a bunch of hand dyed threads with fabulous color variation in them that I think would be really cool in these patterns, especially the flowers. Why? Because from what I can see on the front of the book, some of the designs are screaming for more flashy treatment. The poppies, for example, and some of the smaller motifs. How I would love this book in my living room among all my threads. I have a lot of DMC from my mother and some older stuff from my grandmother that I would love to use. I also bought some hand dyed thread from Sharon B in Aust. and would love to experiment with all of those. So those are the ones I would play with. Please send it to me??!!!!! Hands folded in prayer! Thanks for another chance at this gorgeous book! I would use the wool threads because the designs are too beautiful to compromise on thread. Each design would be a learning experience for me and I would want the finished project to be just as lovely as the picture. Fingers crossed. I would love to see this book! I would use the thread converter. I have a limited budget and the DMC floss is found at a local store. Embroidery can be as thrifty or as expensive as you want it to be. That's another thing that's so great about it. Thanks! I would use DMC because it's what I have available here. Thank you for another great give away, Mary! I been enjoying your letters since you had send it to me. I really like your page. Keep up the Great Job! I would use DMC because it's what I have now. After a bit of practice, I might go hunting for the crewel wool and try that. I would efinitely do them in Soie d'Alger silk as I am not very fond of wool, too matte and no life, whereas silk seems to have a heart beat to it. First off, thank you for giving us another opportunity to win this wonderful book. I would use DMC because it is available locally in Montana. We have a very limited selection of any other threads in retail stores. Probably DMC, because it's what I've used before, and as a newbie, I'd want to mess with one variable at once. If I were to be chosen to receive this book, I would almost certainly use the thread conversion chart provided in the book to convert the colours to Soie d'Alger. Over the years I have worked with Paternayan crewel wool and have enjoyed doing so but my preference over the last 10 years or so has to been to use silk; I love the sheen and the feel of working with it and I find the finished piece gives me a lot of satisfaction. Thank you for another opportunity to have this book. Thanks for another chance at the beauitful book. Thanks to Country Pumpkin also for provideing the book. If I think I would like to try a few of the flowers with Soie d Alger and frame them. I have used crewl wool and also DMC so would like to try something new. Since I really am experiencing many types of threads at this point I see it as a challenge to use different types for different parts of each design/project. Just thinking about the threads to use gives me a wonderful feeling. I would really love to stitch those beautiful flowers.If using Paternayan crewel wool is what i need to make them look as wonderful, i think i would find a way to get my hands on some! It's so generous of you, Mary!!!! I would love to receive this beautiful book. To answer you question, I would not use wool. I prefer to work with DMC cotton because I've plenty of it at home. But if I could afford it, I would LOVE to try silk. It seems so lustrous and soft!!!!! THank you again! That is another gorgeous book, one that I don't have yet. I would absolutely stitch some of the projects in the book as they are the kinds that I love. As for changing the threads, using the conversion chart, I am not sure. I am saying this because I do love to stitch with crewel wool and so far I have not had that many opportunities to do just that, so chances are that I would use the crewel wool for most of them, but I also love Soie d'Alger and have lots of DMC threads at home, so it is a bit of a dilemna for me as in order to make the best decision I would really need to have the book in front of me and study it a bit before making the final decisions. I could stitch some of the projects using the crewel wool and others using other threads this way taking full advantage of the conversion chart provided. if i win the book, i would use the DMC thread. i was always very happy with the result and will always use them. Thank you for giving us another chance at this book. I would use combination of silk and DMC thread which I'm sure will look very pretty. Yippee! Another chance to win this book (and then I'll have to order it). I think I would probably change to another fiber, to see what it would be like, and also because wool always makes me think of moths eating wool, so I don't do a lot of stitching in wool. I would probably try and get some crewel wool,or even Soie d Alger just to stitch these designs.Its a pity that these wonderful threads are not available in India. In case they turn out to be really really unaffordable, I would try Edmar Rayon. I'd work the designs in silk for sure. If I'm going to put huge amounts of time into a display project, I'm not going to use cotton. I've never worked with wool, so I'd probably avoid it, but it might be interesting to try. Thanks for doing a give-away! I might have to go buy this book regardless… So many patterns, so little time! You are so very generous Mary to give away another copy of this book! To answer the question, I would have to say that my dream would be to work with Soie d'Alger simply because of the rave review you have given it. Realistically I expect I would be using DMC because that's what I have in my stash. As I already posted this morning for your generous second offering, I just wanted to ask if when posting the winner from so many great posts, would you again include the places for purchase w/price for those of us who may not be so lucky. After reading all these posts from so many great stitchers I am sure the info will be appreciated! Thank you again! As to what thread I would use, it would depend on the material I am stitching on. Wool would definitely look great with crewel thread. If I was stitching on linen I might use the silk. I think it all depends on the purpose of the project and the material used. I have some lovely vegetable dyed wool just looking for a project – so probably I would use that. I haven't used wool in a long, long, time. I think I stopped using it because of the headaches that I got from inhaling those tiny fibers that seemed to shed off the strands. I would try the silk first. I love the way it feels and flows through the material. But for the whole project, silk might be out my price range. So, depending on how large my project turned out to be, silk would be the choice for a small and DMC if I went for the whole blanket. Oh, Mary, thanks for another possibility of taking this beautiful book. I have a lot of DMC, so I would use this thread. It is most generous of you to give us another crack at this lovely book. From the very beginning, I have joyfully combined wool and mercerized cotton in canvas work and embroidery projects. I love the way that the matte wool makes the shiny cotton pop. It so happens that I am lucky enough to have local sources for Paternayan, Soie d'Alger and DMC, so would probably use all three in the blanket. Selective use of silks in embroidery is something that I have only just started, and I really like the results. It seems that the more different textures and reflective qualities one adds to the mix, the greater the depth of the image. An additional advantage is an expanded palette from which to choose. Thanks again, and good luck to all. A perfect excuse to take out my favourite threads. I would use crewel wool by Renaissance Dyeing. These threads are hand dyed pure soft lambswool and have a lovely depth of colour. There are 100 colours in all, twenty-seven of which are grouped in a special Elizabethan Range using the mordants and dyes that would have been available during the 16th century. They are a joy to use and I can't think of anything more perfect for stitching these exquisite Elizabethen inspired designs. I would most likely use the DMC conversion chart. I have been cross stitching for years and have collected 3 trays of DMC colors. Thank you for the opportunity! I have been following your forum for about five months, and you have inspired me to attempt projects I would have never contemplated. I first saw the book, Embroidered Flowers for Elizabeth, on the Country Bumpkin website, and was intrigued by the beautiful designs. I adore surface embroidery, but have done some counted work. I have discovered that the repetition of doing the same stitch over and over is not my cup of tea (although I love the finished results}. I much prefer the dimensionality of surface embroidery stitches and the fact that one can vary the stitches to gain different results and keep my interest piqued. If I win your generous giveaway, I believe I would do the complete blanket in Appleton crewel wools. Finally, Mary another fan recently has voiced the concern probably most of us who follow you feel. "Loss of your Webite". Please write a book! Even if you self-publish, I believe there would be quite a demand from your adoring public. This looks to be a beautiful book and while I used to avoid small floral "spots" recently I've become intrigued by the repeated use of them down through the centuries. If I were to be the fortunate winner of the book, I would use as a background a wonderful handwoven and lightly-fulled piece of wool yardage I've been hoarding for something special, and that would in turn call for mostly-wool embroidery. Therefore, I'd most likely use handspun wool dyed to my choice of color. I am currently handspinning some mohair for embroidery and would probably include some of that for the wonderful sheen it has, and since I have a lot of silk haunting me I'm sure some of that would find it's place, too. I love these sorts of designs done with a variety of materials; they are sumptuous and have wonderful texture that is difficult to achieve using only one thread/yarn. Thank you once more for making such books available; I (and surely many others) live in a "needlework desert" so I always look forward to checking your blog every day, and these offerings are such a delightful bonus! Hi Mary, another chance to win this fabulous book!!! I think I would use wool on the projects in the book. I have done crewel embroidery before and i like the way it looks. But I also think silk thread would be wonderful. I would use DMC for now because neither Soie d'Alger or Paternayan are available in my area. Thanks to the economy most of our local yarn and needlework shop have closed over the past year. But in the future, if we move to a more urban area as we hope, I'd prefer the silk. Dear Mary: As I look at these wonderful flowers I have 2 projects in mind. One I would do in silk. I recently saw a white stole on a woman priest that had been hand embroidered by some nuns in Europe (Austria, I believe) and it has been haunting me ever since. These could be so beautiful in the silk. But I've also been hankering to try some crewel in wool and winning this book could be just the excuse I've needed. Thanks for another try at this beautiful book. Probably DMC to start out with, at least, because I'm a relative beginner, and would want to work at least one with more economical thread before springing for the expense. Thank you for having another give away of this gorgeous book! WOW! I have some beautiful Stef Francis silk thread that I bought last year; and I've been waiting for a project that would do it justice!! Anything in this book would qualify! Of course, I'd need to buy more of the thread to fill in the gaps in the colors I have. Big grin…might have to go shopping!!! Thank you for another give-away. I would use DMC or some hand-dyed wool which I have at home. Original wool would be too expensive for me at the moment. Maybe one day, after my studies will be finished at last and I'll find some better payed job. i would use DMC on a couple of the motifs. i have been seriously wanting to make a blanket for over a year now. when this book premiered on the country bumpkin site, i fell in love with it. first i would have to save up to buy the money for the blanket and then i would buy the paternayan crewel wool for each diamond as i went. probably having to save up each time. oh, but it sure would be worth it in the end, wouldn't it? Thanks for the amazing give away again. Wow! I would use Soie d'Alger silk threads. I have used them before than the finished piece is lovely. I wouldn’t use the crewel wool but rather Edmar Brazilian threads, Eterna stranded silk, or DMC or because I have a rather large stash of those already and like using them. I have conversion charts for DMC to Eterna and Edmar so the colors wouldn’t be a problem. Once again, I'd love to win this book. For floss choice, I would defintely choose 100% rayon floss (made by EdMar) and I would probably add dimensional stitches here and there and embellish with a few beads and sparklies. I love the rayon floss by EdMar because it is so durable and gives such a nice silky final product. Again, thank you for offering this book. I enjoy your blog each day; thank you for sharing your talent. Thank you so much for such a beautiful give away. I will use wool to make it, as I like to work with it. I would probably try out the Paternayan thread as I have never used it. I tend to use The Caron Collection of silk/wool threads so if I am not happy with the Paternayan, them I would use that. I wouldn't use regular DMC because I think they would look so much prettier in the silk or wool threads. I would use the flower patterns to make something for my Grandmother, as she loves flowers, and maybe something for my mother. If I were to embroider any of these flowers I would probably use DMC because that's all I have! First let me say I love your blog and you are soooo talented. I can't wait to see your next post on your goldwork piece! As far as what thread I'd use for the projects…I'd be tempted to use DMC because I have such a huge collection of it, but I think I'd probably end up using what is recommended. I'm excited to play with different threads and experiment with their textures and how they can be used. Thanks for such a great giveaway!! Oh Mary! Since you have been such a wonderful inspiration for me – and now have me addicted to buying thread, fabric and books online – I would have to start a project using some of the stash I have on hand. A simple project at first and then possibly moving to something a little more challenging. My initial thread choice would be DMC as it is readily available for me to purchase at a low cost (Michaels)and I have a good selection of colours already. Second thread choice – Soie d'Alger of which I have a few colours that I have been saving and want to try. What's with saving thread for something just right. I've become an unstoppable thread collector. Gotta love it! I would use DMC Cotton conversion, because I like finer embroidery and would probably make a finer version than the original wool. Unfortunately, as much as I am 'dying' to try out crewel wool, dmc is about the only thread available here, in Dubai… 🙁 So, it's dmc for me, i guess…. I would use both appleton and DMC, depending on what the fianl use would be. I received all the Appleton colors for Christmas and am planning a big summer project of valances for my sewing room windows – for those I would use the wool. i am working on soem pillows for the couch and a tote for my granddaughter, and would use DMC for those. Thanks for the contest! I would use Soie d'Alger for the simple reason that it enhances the pleasure of stitching. So much of the enjoyment is in the process — handling beautiful threads — and, for me, the hours are more fulfilling when spent with silk than with wool. I would use the suggested threads simply because I am not very creative. I usually follow the directions the first time and if it doesn't work switch to something else. I would also like to see the back of some of your projects. Mine are not always (actually lots of times) presentable. I have very little wool in my thread stash; there is an on-line store which sells Soie d'Alger by the yard so that would be my preference but as my job is going and I have to watch the pennies, it would probably have to be DMC of which I have a good range. That is what I used when I embroidered Susan's 'Flowers for Elizabeth' sweet bag for one of my daughters-in-law to carry on her wedding day. But I do love the sheen of silk and it is so gorgeous to work with. As I would use silk as my ground fabric, wool would not look good even if I had a selection! Mary I've been reading your blog for a long time and have to admit you are quite generous, the Hemengway giveaway that you got as a gift comes to mind and I wanted to mention that. I would prefer to stitch them in the origianl Paternayan crweel as much as possible but I would also use DMC cotton floss for practicing. I would not practice in Paternayan as it is more expensive. Once I got the the techniques down I would use the paternayan as much as possible. If I could n't find that thread then I could turn to Anchor. I haven't a clue, though I imagine http://www.froogle.com would tell me, where to get Soie d'Alger and currently I can get Anchor and Paternayan easily. I would like to try the Paternayan, I have never used it before. I just used Bella Lusso for the first time on my attempt at the crewel rooster and I love working with it so far. I would probably do them as the originals were done because they are beautiful and I'd duplicate that. I think I would use my silk stash that I have been accumulating. It would make for smaller pieces and they could be used for greeting cards, framed as smalls and hung in a cluster, maybe used to decorate a purse or vest. Oh the possibilities! How fun it would be to experiment! I have never tried crewel wools, so I would be willing to use them (if I can find a place where I can buy them of course). I have a basket of Paternayan wool that I picked up years ago at a yard sale – there must be 50 different colors – so I would do some pictures in the wool. But you have inspired me to play around with some of my other fibers, especially the silk. I don't think I'll do another blanket but I will be doing more framed pictures. Yeah! I would use appleton crewel wool, Gloriana Loriket wool, Gloriana silks and AVAS silks. These provide a nice contrast when worked in the same pattern, and are just lucious – especially the silks. Thank you Mary and Country Bumpkin, who really does make the world's most beautiful embroidery magazine. One day I want to attend Beating Around the Bush so I can take classes from their designers, and see Australia while I am there. I would love to make this as a quilt–I love to handquilt–my it would be beautiful; and I love to embroidery too. Your knowledge of thread has really opened my eyes. Although I have always used DMC; this would give me a wonderful reason to start a new thread collection, as I worked thread-painting, block-by-block. New treads with a silky sheen. It would take a while to complete, but it would be an amazing treasure! Thanks for offering the chance to win again! I would most likely try each design in a different type thread. I enjoy many different needlework techniques and have accumulated a stash of different threads. My first thought would be trying Brazilian threads. I do love your blog! I commented this morning on the book, but just had to add that reading the entries from all over the world is such an inspiration! No One I know in this area does any embroidery but cross-stitch and it is a wonderful thing to be a part of an international "sisterhood"! Yay for the Internet and technology! Until I got the stitches down right I definitely would use the thread, most likely DMC since that is what is sold locally. Then I would try my hand at using the Paternayan crewel wool. I love both crewel work and regular embroidery. Hi, Mary, and thanks for the second chance at this lovely book! I would definitely try some wool first, as I'm a crewel novice, but I'm not very fond of Paternayan. I think I would try some of the other wools you discussed in working on your rooster. I would most likely mix silk and cottons in on smaller elements. I really like the difference in textures and sheens that mixing fibers provides! I would use crewel wool because I like the feel of it. I think I would LIKE to use silks but would end up with DMC as I don't have a very good availability where I live. I would love to see these flowers done up in the Brazilian Rayons due to their sheen and their reverse twist. Would I remember to make my French Knots backwards? I don't know but I'd like to try. I think I'd actually try one using the crewel wool, simply because I haven't worked with it at all. I do know that one advantage of the wool is that it "plumps up" a bit, so it's a bit more forgiving with coverage than a single ply of silk or cotton floss would be. I would also likely try using the designs for goldwork, blackwork, or stumpwork! Forgive me if this is a duplicate. I would love to use silks but due to poor availability in my area, I would probably end up with DMC. I would love to see these flowers done up with the Brazilian threads due to their sheen and their reverse twist. Just, would I remember to make my french knots backwards? Thanks. Thank you again, Mary, for the chance to win this beautiful book. I would use the Paternayan crewel wool to make the blanket and then I would use the Soie d'Alger silk to make blocks for a quilt. I would like to see the difference in the techniques with different threads. I've used Paternayan before and really liked the effect. I would use the silk since I've never done anything with silk and would love to see how it stitches and the appearance of it. I would like to try them out in wool first. The thought of using silk intrigues me. I don't have a lot of experience with it, but I am hoping to change that real soon. Hi there! A beautiful book, with lots of potential for projects! I am into samplers right now, and would weave the patterns into future projects! I also would use mostly DMC, as I have a wide variety of colors, plus Brazilian Embroidery thread in many varieties and colors! I would use the Paternayan because I have made up my mind that I'm going to do a scaled-down version of the design on blankets for my two cousins. While they're still college girls, I need a project that will work up fast, and crewel embroidery has much better coverage than other threads I've used — and is so pretty and distinctive. I can't believe you're giving away another of these beautiful books again! You're the best! I think I'd go with the original Paternayan. It's such a beautiful piece I wouldn't want to change a thing! How nice to have a second shot 🙂 I'd use silk of some sort. Probably not through using a conversion chart, but selecting my own colors. Might also play with some wools, but "crewel embroidery" of this sort seems more to be of a later period than Elizabeth. I'm envisioning some of these motifs on historically-inspired pieces, oh yes. I would probably use DMC to start because that's what I have. I made a New Year resolution to try and use more materials I already own rather than buying new. Thank you Mary for sharing your wisdom and for being so generous with giveaways! I would be in inclined to use the Soie d'Alger as I haven't used it before. The idea of embroidering with a beautiful quality silk thread really interests me. I usually use DMC floss but I think gorgeous projects such as these need the finest quality materials. yeh! I finally got the comment box to open up so I could enter. thank you offering this book a second time. I love wool, so I would us wool for crewel work for this project. Thank you for once again offering a copy of the magnificent work of Susan O'Connor. Just last week I purchased my first silk floss from Gloriana and have fallen in love with it, so I would try working a design in silk just to see how beautiful it turns out. Wool is lovely, but now that I have spent so much on the silk I will use it on anything. I am very fascinated with your international followers! It speaks highly of your gift that you share with us. Thanks again for a second chance to win this wonderful book. *joining in again as well* Awesome that you're doing this again! As for your question, I would probably try out all three! I've only stitched a bit with wool but I like it, and I'd like to see the differences between the 3 types of threads when stitching the designs. For making the eventual blanket, I'd probably go for the wool, as I think it has that..blanket-y look. I don't think you will be surprised to hear that I would go for the Soie d'Alger. Why? Well I just love silk and look for every opportunity to use it. I've not used much Soie d'Alger but the one time it did it was a joy to stitch with. I think I would like to try the Soie d'Alger as I have not used them before and I love to try different threads. A mix of different threads could also give an interesting textural effect. I would use wool to stitch the projects. Crewel embroidery was one of my first loves, and it would be a pleasure to work with wool again. Thank you so much, Mary, for the chance to win. This is always fun to see what you are going to do next. The pictures from books and your stitching are great to see. This is another wonderful book. The colors and illustrations are wonderful. It is easy to see how you can use the flowers, leaves in other items. I like to put them on pillows, box tops, pictures, table runners and place mats. I would probably use Soie d'Alger, Water Lilies or DMC. I like the overdyed thread sometimes on leaves for a different look. Thanks for another chance at this book. If I were going to embroider one of the designs, I would want to do the English daisies or the pansy. for the daisy, I would consider changing it to a sunflower, brown center and yellow/gold petals (because I'm a transplanted Kansan). I think I would have to redesign the leaf to a more spiky one like a sunflower. The pansy I would stitch just as it is and I would convert to DMC floss for both. The instructions in the book seem to be very clear. How lovely! I'm most familiar with the DMC cotton floss and, of course, it is readily accessible. I do have a few specialty cotton threads that might fit in nicely. I enjoyed your wool sampler but as I've never worked with wool and have no stash, it might be too expensive or intimidating to get started. I would use the crewel wool to work these beautiful designs. I started my stitching experience in wool and I love how the long and short stitch work up in it. I have a thought to use some needle punch embroidery in the designs also, just to shake it up a bit and give the design more dimension. Thanks for the opportuniy to participat. Well, It would depend on the ground fabric, but probably silks—I LOVE the way silks look. Hi Mary! Elizabeth Braun from Taiwan here.=) Hope you and yours are all well. Just longing for the chance!! This is such a generous gesture on your part! While I am waiting to hear if I am registered for the RSN Day Classes in San Francisco next month, I will continue to fantasize about time to work on projects such as the ones inspired by this book. If I could choose, I would try a variety of threads, just to see what they are all like to work with – and the work fabric would make a difference, of course…..I'd start with the recommended materials and branch out – what a great excuse to build up one's thread stash! Hi I love you news letter , it has got me interested in embriodry ..For what threads I would use would be anything I find in my stash….I have been real lucky finding all sorts of tread and creweling wool at estates sale, I have even got some beautiful linen…..I would love to try and make some of the block in this book….I love looking at new patterns and finding the right thread…sometime it is just as much fun and the stitching…. Since I hit the publish button prematurely I deleted my commnt. Here goes again. FOr myself, when I stitch one(notice that positive attitude) I will stitch it in a combo of cotton, silk and wool threads. Maybe with a hint of gold mixed in. Thank you so much for offering this again. I'd love to do it wools if I can locate a source but if not then it would have to be DMC. Since it's been years since I've attempted crewel work I would probably use the threads recommended by the author. Your blog has me so excited about embroidery again. I'm sooo looking forward to new projects. You make it look so easy (tho I know it isn't). I would use DMC the first time around, as I am a new stitcher, and would want to give it a try with a less expensive material the first time around. However any designs I particularly liked I would then use silk to stitch out. If I were to win this lovely book, I would want to invest in the wool threads since many years ago, I did a few kits completely in wool and loved it. For years crewel with wool has been replaced by cross stitch, and I miss working with the wool. I am being enticed by your daily blog to renew my fascination of surface embroidery. Thank you. Thanks for this second chance to win this magnificent book. I would start off by trying individual designs in DMC as that is the thread I have the most of but if I were to do the whole blanket I would probably use the wool and blow the embroidery budget for at least 2010, if not longer! Thanks for the wonderful giveaway! I will start doing some samples on pillows / throws with DMC threads. Its what I have in hand. But when I (I hope so!) start the actual blanket, I will use the recommended Paternayan crewel wool. I have never worked with crewel wool so that would be a challenge for me. Looking at the pictures from this book on your blog, I would have to choose the same wool that the author used. The colors look rich and vibrant so I would like to replicate them. It's a beautiful book and I love the designs. I think I'd use Soie d'Alger–it's so lovely. But I'd experiment with several threads before making a final choice. Thank you for the second chance to win this wonderful give-away. I would not use the thread that is shown in the book since I have never worked with it before. Instead I would use the conversion chart for DMC for a few of the projects. That would allow me to begin sooner since I am able to buy DMC in a neighboring town. If I were to stitch some of the projects in this book I would probably convert the threads to DMC first and then compare these colors to Soie d'Alger. If the dyelots are compatible I woulld probably use the Soie d'Alger. I would change the threads because I would probably be framing them and would prefer them in silk. sue d.
If I get to see some designs of the book.I will try them with Anchor cotton and Silk whichever gives a good look and feel, will proceed with the same. I would use the Paternayan wool as I love the way it looks on the front cover. Also, after following the Crewel Rooster I am inspired to try wool which is something I haven't used before. Thank you – and Country Bumpkin – for this second chance to win such a lovely book. It's inspiring to see how many readers are ready to "push the envelope;" I'm still working on opening mine! Were I to stitch some of the projects in this book, I would start with DMC, because it's what I know, it's what I have on hand, and it's what I can afford. I am following your goldwork pomegranate with great interest, and am "staying tuned for the next episode." I love it that you're loved all over the world! Thanks for giving us another chance to win this beautiful book. I cannot get hold of silk or wool here, so I suppose it would have to be DMC. The result might not quite as good, but …. what you don't know, you don't miss! Thanks for the second give-away! You are wonderful! I would use the crewel yarn as suggested. I love working with wool; I like the feel and the texture. I also love crewel work even though it seems it's not as popular as other types of stitching. So there you have it! I have always adored flowers, in artwork, embroidery and love books on the subject. I would probably have to use the conversion chart as threads for choice are not freely available. I so look forward to reading your blogs every day. Best wishes. I am still drooling over this book! Winning this would make my day – week – month???? I would like to do the project with wool, but I would probably go for DMC since I have a boat load of it. I'm thinking wedding present for the niece….. I love crewel, and I would use the Paternayan crewel wool to stitch the entire blanket. This book is a treasure! Thanks for the opportunity to win it! Un grand merci pour tout ce que vous nous montrer. Thanks for your lovely give away! Gwen from Dordrecht, the Netherlands. Greta to be back on your second giveaway!! Ah! it's a tough question for me :). Ideally I would want to use the Paternayan crewel wool according to the instructions, as that would definitely be a difference stitching experience… but due to the limited thread availability in my locality, I would have to choose my own colours of anchor threads which will go along with the stiching instructions.. I have tryed to use silk for another pattern from Susan O'Conner. This book is one I like to have and in this time I can order it from Amazon.de. But now I have a chance to get it from you! I would embroider the flowers with silk or with DMC first. Why: I don't have some experience with wool thread, but I will learn it and I think this book is a good chance to do this. Please may I enter for the give-away. Were I lucky enough to win the book, I would use DMC Madeira wool as I have that on hand and wool is more forgiving to use than DMC. I have lots of DMC stranded threads and no outlet nearby for the silk. Wow. That's a lotta comments! 🙂 How great is that? If I could afford silk, I'd use that. If not (which is far more likely), good old DMC would be the way I would go. Besides, washability is important to me. Wool..hm. I might spin some superwash if I could find compatibly dyed wools…and then use that. Judging from your very detailed photos, I would want to stitch using the original wool threads. These look so sumptuous in the pictures. I have used substituted threads before and am sometimes disappointed, because although they try to match the colours to the best fit, they don't always look like the photos. After all, we pick a design based on the photos don't we. Since the moths here love wool, it would have to be silk or cotton. Sending something to someone in a colder climate, definitely wool. I wish dmc still made their beautiful medici crewel wool… but alas. I would probably stitch in paternayan or possibly see if there is enough in the appletons range. Thanks for the give away. Well I would like to do the designs in Anchor cotton threads 'coz its the only available option for me here.. We don't get any other threads. Wish me gud luck..
Mary – you have such a generous spirit and we are grateful to you! As for me, I would like start by doing a small square using DMC. Mostly because I don't really have a store nearby that carries a good selection of wool and, when undertaking a major project, it is always good to take small steps. So, for me, first, give the whole thing a little try with a thread I'm familiar with and then see what evolves. I'd use DMC cotton thread. It's what I can find in stores near me. I know anything is available online, but I like to see the colors I'm choosing in person. Hi, Mary! Thanks for another chance to win this book! I think I would use the conversion charts and stitch the project in Soie d'Alger. I have slight allergy to wool and may be inviting a reaction if I were to handle it too much. I've often converted other projects to Soie d'Alger and find the end result is just lovely – silks are just so elegant. I'm just thrilled that you're giving us a second chance at this book, Mary. Beautiful! I have taken a long break from embroidery and just getting started back. I would love to try this with the silk thread or the wool as shown. I would try to do this embroidery not with woollen threads, but with silk and rayon ones ! why ? because they are light-full and so "doux" in my fingers ! Good luck to all in the draw. I would use wool if I was doing pieces to frame, but would probably choose DMC cotton if making a blanket because I think it would hold up better through the inevitable cleanings. If the texture was totally off with cotton, I might use something that was a wool blend. Oooo, such a lovely book! I would convert the crewel threads into Soie d'Alger because it gives a finer product that works well with my crazy quilting. I would probably do them in silk. But I would be interested trying to do it "by the book"
Thanks for the second chance.I would use the conversion chart and Soie d' Alger thread. I am also enjoying your goldwork project. As soon as you've completed it I am going to start my own. If I received this book, I would try out some new-to-me silk threads I have, probably using different ones in the same frame, in order to see the contrasts: shiny, flat, pearled, s or z twist! Thanks for the second chance at this enticing offer! I would love to use the threads as she gives them but I can't always find the right ones so I end up using DMC which is always easy for me to get hold of. I would use DMC thread to attempt these beautiful projects because, being a total novice, that's what I'm familiar with. Thanks! Mary: Thanks for giving away another copy of this gorgeous book! I am just getting back into doing embroidery after a long hiatus practicing law. It's so therapeutic, I don't know why I didn't make the time for it when I was still actively practicing. I would love to get some wool thread and practice with it, but must confess that I am more confortable with DMC and silk thread. Thanks for sharing your talent via this blog. I look for your posts each day! Mary, I would begin using the Paternayan crewel wool. Once I mastered the use of wool, I would try silk, another difficult thread. I think I would try to track down all of the colors in Paternayan crewel wool first, because I would like the soft look of wool for this particular project. If I could not get all of the colors I needed then my second choice would be the Soie d'Alger because I love silk. Great, another shot at the book! Paternayan – ugh. Too hairy. Same for Appleton. I don't always pay attention to the thread colors listed; I often change them or use threads for which there is no listed conversion. I would start by experimenting with Renaissance Dyeing Wool or floche. Though I like the look of silk my fingers snag it no matter what lengths I go to to safeguard my hands.